South Alabama set up a web cam a couple weeks ago for us to track progress. The open date on the recently named Hancock Whitney Stadium will be September 12, 2020. It's a sad day in the Ville. 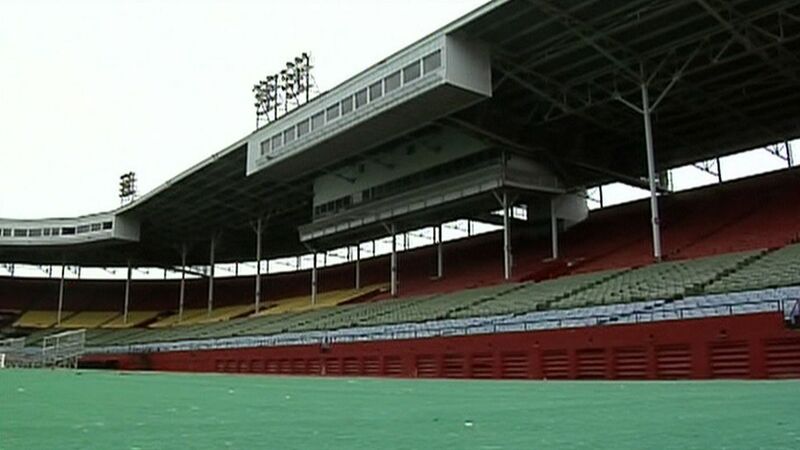 Louisville football's home for almost 50 years, Old Cardinal Stadium, is being torn down tomorrow. It was last used by UofL in 1997, prior to the opening of the current Cardinal Stadium in 1998. I know it doesn't look like much, considering it's old rickety minor league baseball stadium, but it was home, and there were many great memories there over the years. Memories such as beating Texas, Brett Favre's hail mary, Farm Aid, the 1st Thunder Over Louisville, high school state championships. Not to mention the Louisville Redbirds. Thanks for posting this. Driving to Louisville from Leitchfield most times I attended quite a few AAA baseball games, rock concerts (HEART and others) during the state fair along with one or two football games. I thought it was an excellent minor league baseball park--especially sitting under the roof. Music concert acoustics were also pretty good. A. Ray Smith brought baseball back to Louisville in 1981.He was quite the salesman and they set new minor league attendance records. They had excellent food at good prices and even allowed fans to bring their own picnic baskets!! Tickets prices were low. I've still got some ticket stubs somewhere. Got to see a lot of future major league stars. Great memories. The place will be missed! p.s.----Anyone know what year it was built? (01-23-2019 05:03 PM)TOPSTRAIGHT Wrote: Thanks for posting this. Driving to Louisville from Leitchfield most times I attended quite a few AAA baseball games, rock concerts (HEART and others) during the state fair along with one or two football games. I thought it was an excellent minor league baseball park--especially sitting under the roof. Music concert acoustics were also pretty good. A. Ray Smith brought baseball back to Louisville in 1981.He was quite the salesman and they set new minor league attendance records. They had excellent food at good prices and even allowed fans to bring their own picnic baskets!! Tickets prices were low. I've still got some ticket stubs somewhere. Got to see a lot of future major league stars. Great memories. The place will be missed! 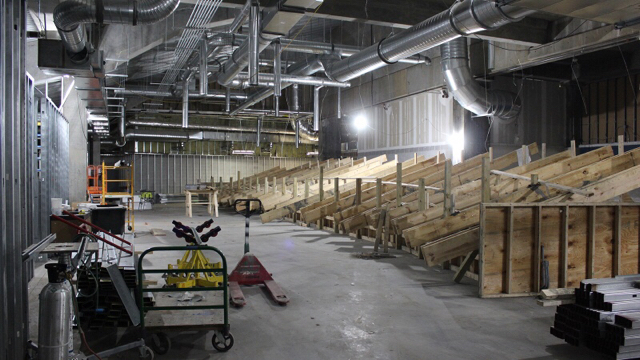 Williams stadium is upgrading the Football Operations Center (FOC). Expansion takes place in the endzone and finishes in 2020. (01-25-2019 11:15 AM)WesternSkillet Wrote: Williams stadium is upgrading the Football Operations Center (FOC). Expansion takes place in the endzone and finishes in 2020. Looks nice...however, I hope they work on better entrances so folks can get through quicker. Why Flames and not Broncos in the end zone? It's for Liberty University, the Flames. At the NAIA level, Montana-Western is getting a new stadium on newly donated land adjacent to campus. Badly needed. They currently use a community stadium a mile from campus. Just a quick update. The Carrier Dome will start the renovation project in March. It appears Lacrosse will have some games moved. 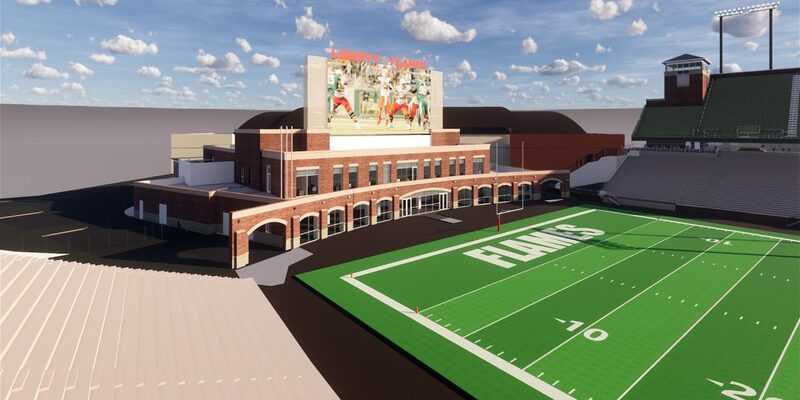 Quote: UMass Director of Athletics Ryan Bamford released the first renderings of the $18 million McGuirk Alumni Stadium improvement project that will see a new scoreboard, new permanent bathrooms, and an indoor practice facility installed before the 2019 season. Also included in the renderings is the new south end zone club with the video board. Other improvements will happen in 2020 for the 18M including ADA access and handrails and new concessions and a few other improvements. There will eventually be 4 price points for season ticket holders. Yes, but only in the bathrooms. (02-10-2019 07:44 AM)panama Wrote: Any increase in seating? There will be tables and chairs in the south endzone. But no not really. However getting McG up to spec with ADA compliance will mean that future work can be done to the stands themselves. (And not as a "separate" structure like the pressbox) That opens up possibilities for expansion over several phases, which would likely be less expensive than building all new grandstands. One such plan (the original expansion plan back in 2011) is to lower the field and fill in from there. Installing a full bowl around the lowered field would up its capacity to ~30k. However, expansion won't come until it's needed. Luckily if UMass does see a big enough rise in attendance, McGuirk can be (and has been in the past) outfitted with bleachers upping its capacity to the low/mid-20k's. Foundations done and starting to go vertical now. Update from the official release today. Quote: The stadium improvements project will include a state of the art video board and auxiliary board. 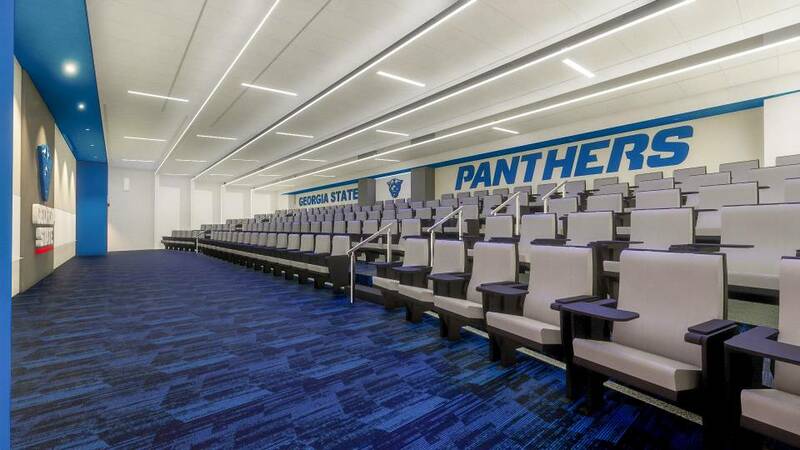 The video board will replace the existing structure in the south end zone and the auxiliary board will be located on the far-right corner the Martin Jacobson Football Performance Center. The system will also feature an enhanced audio speaker system replacing the previous units and providing a better overall fan experience. Paul '87 and David Manganaro made a $500,000 gift in December to support the video board that will be 48-feet wide by 20.4-feet high. UMass has again partnered with Daktronics, the leader in videoboard technology, to bring this significant upgrade to the in-stadium atmosphere on game days. This will be the second project between the University and Daktronics after the new end wall and centerhung system was installed in the Mullins Center prior to the fall of 2017. A new hospitality plaza will be created in the South End Zone as well offering the opportunity to enjoy the game from field level with food and beverage options available in that location. This addition will now give fans and donors two exciting, premium vantage points to watch UMass football between the plaza and the Hunt Hospitality Suite and Balcony in the North End Zone. The initially announced air-supported bubble has been enhanced to be an entirely separate turf field practice space which will have a seasonal dome. The 240-foot wide by 400-foot long turf facility will offer an expanded space for teams to practice while the seasonal, air-supported dome will provide the ability to work indoors during inclement weather and during the winter seasons. The practice field will be placed parallel to McGuirk Stadium behind the Martin and Richard Jacobson Press and Skybox Complex. A generous $5.58 million gift from Martin Jacobson this past June was a key component to the facility project which will benefit the entire athletics department, its student-athletes, club sports and intramural sports. "This project will have a long-term positive impact on our athletic department, fans who visit McGuirk Alumni Stadium and UMass students," said Director of Athletics Ryan Bamford. "The South End Zone project will give us some terrific entertainment space and the new HD videoboard and sound system will enhance the fan experience inside McGuirk. We are also thrilled with the new indoor turf facility and know it will give our sport programs and student body training opportunities during the winter months." Further enhancements to the fan experience include the addition of new restrooms to both the East and West sides of the stadium along with several ADA enhancements in the stands and surrounding areas. By the start of the 2019 football season, the McGuirk Stadium enhancements (turf field, videoboard, south hospitality plaza, restrooms and ADA upgrades) will be complete. The bubble over the new turf practice field will be installed in November 2019.